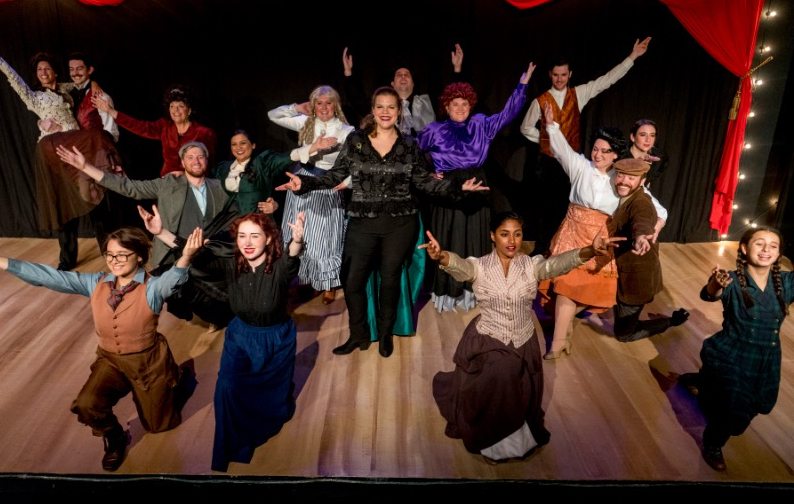 Carol's Theatre Reviews ~ It's Fun To Go Out: OnStage Playhouse Tackles “The Mystery of Edwin Drood” In A Big Way. OnStage Playhouse Tackles “The Mystery of Edwin Drood” In A Big Way. 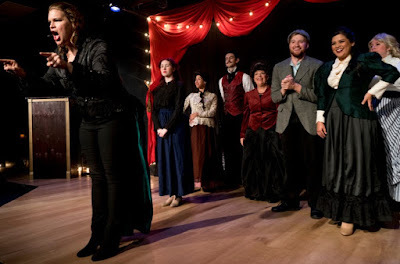 I have always regarded myself as a super sleuth so it was with relish that I found myself in the audience of OnStage Theatre and Turning Tydes production of “The Mystery of Edwin Drood” or ‘who slew Edwin Drood’? For those not in the know, “Drood” was the last and unfinished novel that Charles Dickens wrote before his unexpected death. Rupert Holmes, not to be confused with the Sherlock of the same name, came on to the scene in 1985. The musical ‘Drood’ debuted at the New York Shakespeare Festival and later transferred to Broadway where it ran for two years. The musical, “The Mystery of Edwin Drood” was revived in 2012 at the Roundabout Theatre Company. Holmes, who took home two Tony Awards for his busy little romp, is the culprit who came up with the idea to write a ‘musical mystery’ (along the lines of Mystery Theatre, and Dance Hall shenanigans), and turn Dickens’ book into a musical comedy; a who-dunit stunt and a ‘play within a play that all takes place in a 19th century music hall (Alex Bezdeka and Jordan Hall Campbell). 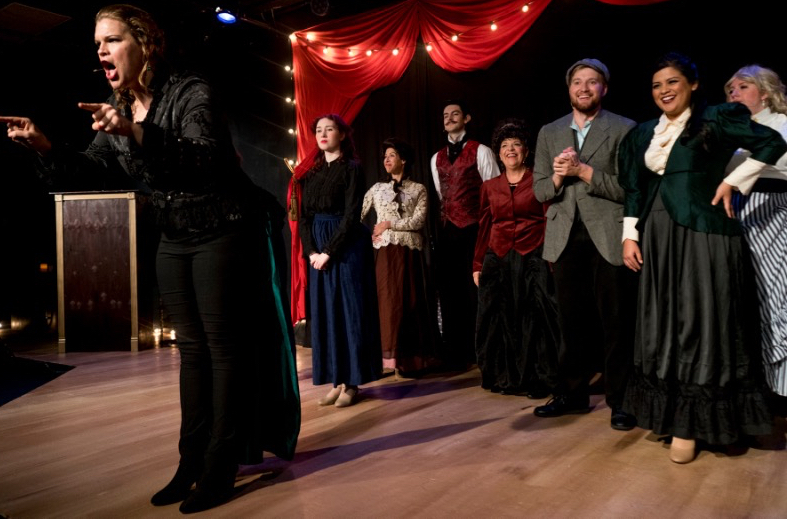 Here the characters step out of character as the dance hall entertainers and step into the characters in Dickens’ play as characterized by the author. It’s a study in turn on a dime characters, most taking on at least two roles in a faster than the speed of light costume changes (Summer Blinco and Andrea Pulliam) and all having some real chops to sing the more than dozen musical numbers. A fun one to watch “Off To The Races” is for a belly laugh with the whole company involved. 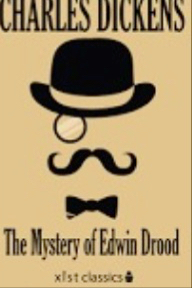 I case you might not know Dickens’ “The Mystery of Edwin Drew” let me tell you that it's OK. It is a convoluted mess with so many twists and turns that you should thank your lucky stars Holmes turned it into a dancehall musical while keeping the characters and the story intact. It's an easy way to know the story without reading it. He just put a different spin, some might call it a gimmick, adding the play within a play and music (for this production pre -recorded and directed by by Jordan Hall Campbell who was also in the choir of “Hunchback” at The La Jolla Playhouse) to add more entertainment value to the author's work. Leave it up to the smaller theatre’s, like the ‘little engine that could’ and OnStage Playhouse that keep chugging until they make it round the bend to produce a large show on a rather limited stage (costume changes were done in the theatre’s lobby) with an eighteen member cast and pull it off with flying colors. Much to my surprise, having never seen this show, I was taken in immediately as the cast mingled throughout the audience encouraging them to take their seats, welcoming them to the ‘Theatre Royal’ and that a performance will soon begin. Some promoted themselves (don’t forget, there is voting at the end) and others just getting a bit cozy with everyone whose eye they caught. Band Roll!- Da ta da da -and our Chairperson (a charming, appealing and direct Georgia Ladd) steps out from behind her podium (“There You Are”) and were off to the races. The characters are introduced and leading among them is Rose Bud (Summer Blinco who has a simply astonishingly wonderful voice) as the almost naïve fiancée engaged to Drood (Jordan Hall Campbell) who has been mysteriously murdered and missing for two months. Blinco’s turn with her contemporaries in Act I and their wonderful “Moonlight Quartet” is a showstopper. 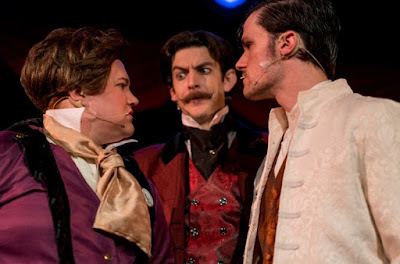 Tyler C. Jiles (“Hunchback of Notre Dame at Moonlight) is John Jasper the leading character and uncle of Drood. As the mover and shaker he is the suave, angry and the evil- minded music teacher/ drug addict and Drood’s major rival. Check out his voice as well. He too is in love with Rose Bud, his student. He is a complete standout and pretty attractive as evil goes, and rises to the occasion at every turn. Love his handlebar mustache. Kat Fitzpatrick is a hoot and a howl and one of my favorite characters, in a role starring Chita Rivara on Broadway, as the opium dealing Princess Puffer. No spoilers here, but do keep your eyes out for her. (“The Wages of Sin”, “Don’t Quit When You’re Ahead” and “The Garden Path”) She is simply a hoot. Included in the list of folks to be watched are the Landless Twins (Jacob Painter as Neville and Kaitlyn Summers as Helena). They are from Ceylon or some far off country and are mysterious characters from beginning to end, but fun to see as they weave their way into the story. Again, no spoilers here but beware of the vicar (Patrick O’Connor) acting holier than thou and oft times pompous and slimy. Keep yours eyes out for him. Unfortunately I voted for Allan Hopkins’ as the Durdles character because as the drunkard sexton and off in the background as part of the ensemble I thought he might be up to no good. Sleuth status reduced. Hats off to director Alex Bezdeka for reigning in her large cast and assembling a very talented company. Most of members take part in audience participation and create the overall dancehall atmosphere needed to breathe life into this large production. Overall not a weak link. The leads singers, dancers (Candace Carbajal) most of whom I had never seen before bring home the bacon in this rather bloated story of romance, mystery, mayhem and music. It runs a bit over two hours with intermission. That leaves one unfinished piece of business. The body of Edwin Drood was never found. Hmmmmmmmm. Do see it. Two thumbs up for a frolicking and rousing evening of theatre.